The use of genome-scale metabolic modelling in system strategies for the production of platform chemical such as succinic acid in Escherichia coli has received renewed attention in recent years. The advances in high-throughput technologies and the development of E. coli genome-scale metabolic models (GEMs) have been considered indispensable in the current emerging strategies for strain design and biobased succinic acid production. 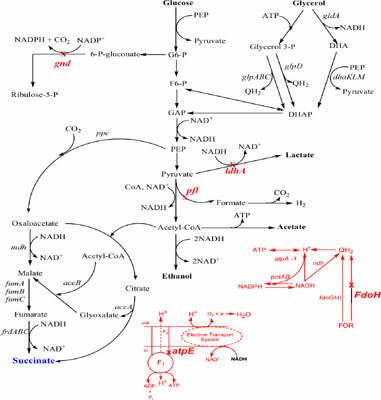 Thus, much interest has developed in understanding the metabolic fluxes at genome-scale level that increase succinic acid production in E. coli. A range of proof-ofprinciple strains were previously constructed by single gene knockouts guided by GEMs in E. coli as case studies. This review pinpoints recent advances in genome-scale metabolic modelling for increasing succinic acid production by deploying different versions of E. coli GEMs and probably beyond succinic acid. E. coli, genome-scale models, bio-based succinic acid production, proof-of-principle strains, metabolic fluxes, GEMs .